Large carnivores and their prey need healthy, spacious habitat in order to thrive, but huge tracts of land have been decimated by the grazing of domestic livestock. About 2,400 grazing authorizations are granted to ranches across 12 western states each year. The author describes the problems that can cause, along with current efforts to return grazing land to a wild state. Wild Canids Among Us: Can We Coexist? More than three billion people now reside in cities around the world. As we’re moving into town, canids are right behind us, and they’re subjects of growing scientific interest—so much interest that they have earned their own name: synanthropes. Here’s what researchers are learning about this growing group of city-dwelling carnivores. 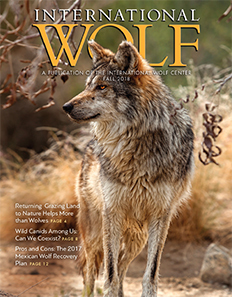 The 2017 Mexican wolf recovery plan, an update of a plan devised in 1982, has evoked strong reactions from biologists and environmentalists. Here, two experts present opposing viewpoints on the validity and effectiveness of the plan—one questioning the science involved, and the other declaring it solidly designed to assure the survival of this wolf subspecies. Download full article. It’s dynamic, fun and mega-fauna charismatic. And it’s coming in 2019! In some respects, it was a museum exhibit that led to the creation of the International Wolf Center. In the early 1980s, the Science Museum of Minnesota developed a natural history exhibit featuring the social, biological, mythological and ethical relationships between wolves and humans. The 6,000-square-foot “Wolves and Humans” display won awards, set attendance records and eventually went on tour in 18 cities around the United States and Canada. One of the main biologists from whom the material for that exhibit came was Dr. L. David Mech. The winter of 2017-18 included some tense moments as the 2016 International Wolf Center litter matured and began testing for status over our pack leader, Aidan. Testing behavior was not a constant pattern, but more a combination of behavioral occurrences that built over time, significantly influenced by seasonal hormones and cooler ambient temperatures. If you strike up a conversation with this friendly woman from New York City, one of the first qualities you’ll notice is her strong Brooklyn accent. Joan Silaco is a collector of anything and everything with a wolf on it. The loyal New York Mets fan currently lives in Queens with her sister and a 13-year-old German shepherd named Wolfie, and she’ll admit that every inch of her own room is covered with wolves. story, may contain important lessons, tell a joke or reveal the moral values of the culture it came from. Cultures may also have mythology—a whole collection of stories passed on through generations, as if they were true, that are used to explain mysteries like the origin of the world, or the behavior of humans and animals. In myths and folklore, wolves have been used as characters to discuss social issues—human issues—when in fact, real wolves are focused only on their own survival. The trail led to my favorite lookout. As the sun’s rays began to penetrate the mist I could make out a herd of bison—thirty of them, mostly lying down. In the distance, I saw a faint, long line of black—a larger herd of bison joining the ones lying down. It was coming my way, possibly two hundred head. Then I noticed a shorter, white line moving briskly toward the herd—wolves! Mating between domesticated dogs and wild wolves in Europe and Asia over hundreds of years has left a genetic mark on the Eurasian wolf gene pool, new research has shown. The international study reported by Eurekalert.org, an online source for global science news, indicates that around 60 percent of Eurasian gray wolf genomes carry small blocks of DNA from domestic dogs, suggesting that wolves cross-bred with dogs in generations past. The results indicate that wolf-dog hybridization has been occurring for centuries across a large part of Europe and Asia. The phenomenon is seen less frequently in North American wild wolf populations. Despite the evidence of hybridization, wolf populations have remained genetically distinct from dogs, suggesting that such cross-breeding at low levels does not diminish distinctiveness of the wolf gene pool. Because of her love for the animals, a young woman is dedicating her life to raising wolf pups for a center in China’s Inner Mongolia Autonomous Region. According to the Yangtse Evening News, 25-year-old Yang Wenjing left a job in tourism to volunteer at the center, where 36 wolves, on average, are cared for. As wolves move closer to urban areas of Europe, “wolf safaris,” hosted by a Finnish art collective the name of which means “Other Spaces,” are being held across Western Europe and Russia to build understanding of the wild canids. Other Spaces producer Timo Jokitalo told the online media outlet CityLab.com that the idea was an offshoot of a performance in which the public was invited to learn about and act like reindeer. The exact location of Lupercal, the cave where twins Romulus and Remus, believed to have been Rome’s founders, were according to legend suckled by a she-wolf, is a subject of academic inquiry. The city’s creation story gave rise to an epic festival each February 15 called Lupercalia, named for the twin “wolf-men,” or Luperci. Goats were sacrificed and their skins cut into strips with which scantily-clad young men flailed at women while running through the city in a practice believed to enhance fertility—which the women encouraged. Ethiopian wolves (Canis simensis), which while not true wolves, are related to them, are threatened by a trifecta of rabies, canine distemper and habitat reduction. An effort to vaccinate wild populations against rabies has, in some cases, only seen the animals die of distemper months later. Members of the Ethiopian Wolf Conservation Program have spent 30 years tracking the animals across harsh terrain in difficult weather to carry out the inoculations, witnessing during that time four major outbreaks of rabies alone, each reducing some populations by as much as 75 percent. The world mourned in March as the last male northern white rhino, Sudan, passed away. Guarded continuously by armed patrols, Sudan was euthanized and laid to rest as the last male of its kind—a clan of rhino that lived for millions of years, withstanding every challenge except humanity. With only two females remaining, the northern white rhino is staring down the barrel of certain extinction and represents, as Sudan’s caretakers put it, “a cautionary tale for humanity.” Download full article. In 1952, Soviet geneticist Dmitri Belyaev boarded a train to Tallin, Estonia to meet his friend and colleague, Nina Sorokina, chief breeder at a fox farm outside Tallin. Under the guise of breeding more luxurious pelts, Belyaev made a peculiar request; he asked Sorokina to identify and breed silver foxes based not on the quality of their fur, but on their behavior around humans. Most silver foxes responded to humans either aggressively or fearfully. A few seemed to respond more calmly. For Belyaev, these calmer foxes might hold answers to his questions about the domestication of the wolf into the dog. Under Belyaev’s direction, Sorokina (and later, Lyudmila Trut) began to select and breed foxes based on their reaction to humans. Within 20 years, Belyaev and Trut’s experiment showed that breeding for one quality—tameness—also triggered doglike traits such as floppy ears, rounded faces and wagging tails.